Fruit is one of my favorite food groups! Some are concerned about the sugar content of fruit, however what we should be concerned with is the added sugar found in processed foods. These healthy carbohydrates with natural sugar along with nutrients, antioxidants and fiber your body needs should have a place on everyone’s plate. Nutrition experts recommend adults get 2-3 servings of fruit each day. Put your daily fruit servings out on a plate. Select fruits with more potassium such as bananas, prunes and prune juice, dried peaches and apricots, and orange juice. One of my good friends loves the strategy of putting out your daily fruit servings on a plate a perfect reminder to finish eating these nutrient packed carbohydrates by the end of the day! This entry was posted in Eat Real Food and tagged Eat fruit everyday, Healthy carbohydrates, Natural sugar. Bookmark the permalink. 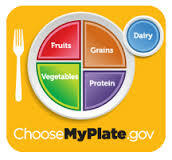 ← Fill up your plate with healthy greens and other produce.